The largest state remaining in the Democratic primary season is California, and a new poll puts Hillary Clinton only 2 percentage points over her rival Bernie Sanders. 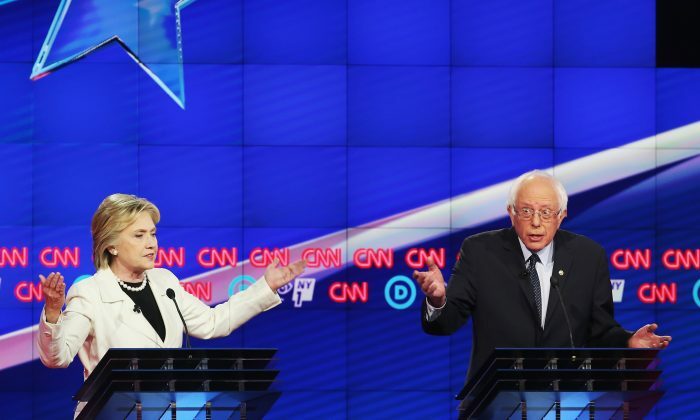 A new poll released by the Public Policy Institute of California shows Clinton with 46 percent to Sanders’s 44 percent, within the margin of error of 4 percent. The tightened race comes amid pushes on both sides to step up advertising and appearances in the state. Sanders began buying space on the airwaves last week after initially saying he wouldn’t buy advertising in the notoriously expensive states for television advertising, given its size and the number of media markets. Clinton responded by also taking out ads, which are set to begin running on May 27 in the Los Angeles, Fresno, and Sacramento markets. Other polls in California have shown a larger margin for Clinton, with a Survey USA poll giving Clinton an 18 percent lead on Sanders. In a previous PPIC poll, Clinton showed a larger margin, with 48 percent to Sanders’s 41 percent. An average taken from RealClearPolitics shows Clinton up by a margin of 8 percent, 50 percent to 42 percent. “We believe that Hillary Clinton’s time is best spent campaigning and meeting directly with voters across California and preparing for a general election campaign that will ensure the White House remains in Democratic hands,” said Clinton’s campaign communications director Jennifer Palmieri in a statement. “If I debated him, we should have such high ratings, and I think I should give—take that money and give it to some worthy charity, OK?” he said. California will be the biggest prize on June 7, when voting takes place, with North Dakota, South Dakota, New Mexico, New Jersey, and Montana also voting the same day. The District of Columbia will be the last to vote, on June 14. Regardless of the outcome in California, Clinton is set to clinch the majority of delegates on June 7 with her needing 77 delegates (including superdelegates). Losing California, however, would be sure to dampen her victory, as it’s a state she won in 2008 against Barack Obama, and it’s also a state that her husband Bill Clinton won in 1992. Clinton and her campaign adamantly deny that they did anything wrong.